FDA Warns Maker of Sports Supplement For Use of "Meth-Like Substance"
Apparently, the makers of once-popular sports supplement Craze have been putting more than protein in their tubs. 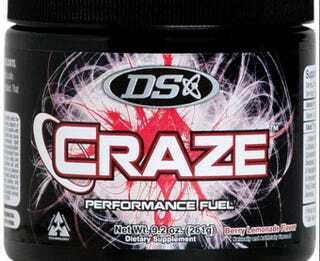 On Tuesday, records dated April 4 were made public that showed the FDA warned Driven Sports, the makers of Craze, about the presence of an undisclosed "methamphetamine-like substance" in the product. Apparently an independent study by a group of researchers found the presence of something called "N,alpha-diethylphenylethylamine" (I have never been as glad for the existence of the copy-paste function as I am at this moment). Driven Sports had stopped manufacturing the product last year in the wake of a USA Today investigation, but had since started selling a similar product called Frenzy — but only outside of the US. Apparently, the company's founder, Matt Cahill, has a history of putting risky products on the market and then dodging regulators for as long as possible. Cahill, a former felon who plead guilty to mail fraud and introducing misbranded drugs to the market in 2005, was also the guy behind Superdrol, a designer steroid that was ultimately linked to liver damage. There's also a Federal felony charge pending against him in California for ANOTHER drug, Rebound XT, which contained an undisclosed anti-estrogen drug. It's unclear whether the FDA plans to pursue criminal investigation against Cahill, but given the guy's history of doing the same thing over and over and over, it seems like they'd be crazy not to. I'm trying to stay serious and impartial here, but does anyone else find it funny that roided-up monsters have been unknowingly peddled with something a whole hell of a lot like meth? Is that just me? Just checking here.